A devastated mother has shared a harrowing photo online showing the effect childhood cancer has on families. 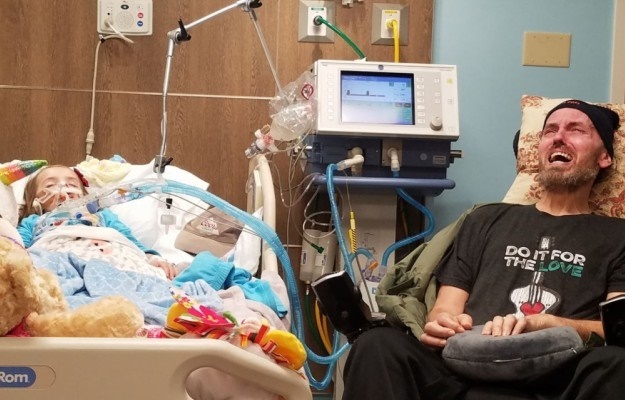 Ally Parker, from Florida, US, decided to take a photo of her father, Sean Peterson, as he sat wailing at the bedside of his five-year-old granddaughter Braylynn Lawhon after finding out her condition had deteriorated. According to the Mirror, a devastated Sean suffers from motor neurone disease and can no longer speak. And only days before Christmas, five-year-old Ally was diagnosed with Diffuse Intrinsic Pontine Glioma (DIPG) – a deadly form of brain cancer that can’t be cured, according to Boston Children’s hospital. Ally reveals that she took the heartbreaking photo to show that the world is a “terrible place” as she’ll be forced to say goodbye to her daughter and dad within weeks, reports The Sun. “We all thought that they’d outlive the rest of us. and we certainly never thought that my precious little Braylynn would be the first to go,” Ally wrote on Facebook. “Last year was hard for us, but I can't even begin to explain how difficult this year will be and has already been. “In a few days, I will have to bury this beautiful little girl. The distraught family were given a glimmer of hope last week after they managed to raise funds to give the tot a chance to try an experimental Mexican treatment, reports the Daily Mail. But before they could take little Braylynn to receive treatment, her health deteriorated after doctors discovered a bleed coming from her tumour. Ally now hopes to fight for more awareness and funding for the disease. “These kids deserve so much more than that, someday soon someone needs to find out what the cure is,” says Ally. “Braylynn is still here. Pulse is still strong. Vitals are still normal. “It may take a few days because everything is going to be PERFECT for her big day. Until then, she’s still with us, still fighting, still strong.